Henry Naylor's Fringe First winning show Games comes to the Arcola Theatre for a limited 3 week run! 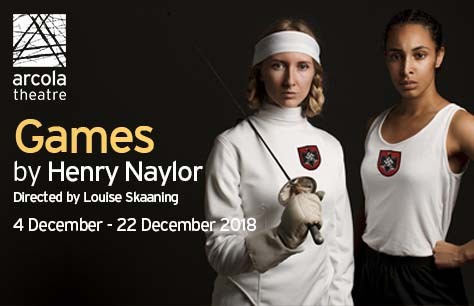 Tickets for Games, Henry Naylor’s Fringe First winning show, are now available for the extremely limited Arcola Theatre run! Henry Naylor’s Fringe First award-winning show is based on a true story and tells a cautionary tale for our modern age. This incredibly moving true tale comes to London’s Arcola Theatre for a 3 week run just before Christmas. Games tickets are sure to be in high demand. Book tickets to Games now to ensure the best seats at the best prices. Best play I have seen for years, and took along 2 -18 year old's who enjoyed it so much they came back the next day- of their own volition- to watch Borders too. He is a genius playwright and I will try and see everything he does from now on. A thought-provoking well written , extremely well acted play. Interesting true story that is pertinent today. We can learn from history and hopefully make sure by being aware we can prevent injustice and discrimination from happening. Brilliant night out and strongly recommend the play and the Arcola is a great theatre space and the bar is worth visiting too.